Crunch, crunch, crunch! Not the happy sound of a brisk walk in the snow methinks, but credit disappearing into Darling’s boom machine – or is it bust!! Gordon has exceeded all my expectations. I did not rate him as a chancellor and I have been vindicated in trumps with his exploits as a PM. Luckily I do not own any shares, my bank banks with me rather than vice versa and my house was bought that long ago that to achieve negative equity would require a yurt being the basis upon which prices are standardised. (Did you know that you can buy the top of the range model from – wait for it – yurtsdirect.com – for a mere £49,000). Enough of this piffle if you want the real low down read the FT. The year did not start too well unfortunately. 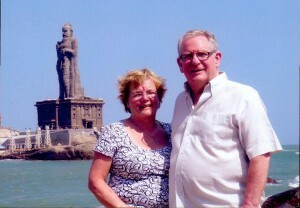 I got word just before last Christmas that my sister had been taken into hospital. Her husband thought it wise for me to nip over and see her so I knew she must be poorly as I haven’t been to Birmingham for over seven years. Turned out she had been misdiagnosed as arthritic; we don’t know for how long, but really she had a melanoma on the brain and advanced lymphoma. She died on 6 January three weeks after admission. At least she didn’t suffer for too long. After the funeral I kicked myself back to normal. We could get into a discussion “ what is normal” but it is probably better not to go down that route. Not to labour the subject, I am on the books of the Psychology Faculty at Southampton University to assist with various research projects. These are usually to do with memory, age and lifestyle, though not necessarily in that order, (where was I), but in February was landed with a 20 page survey on Nostalgia; very interesting. I have discovered that, strictly according to the dictionary definition, I am not nostalgic at all. Its main requisite is a longing to return to some event or events in the past. Although I have great memories of events, people and places and enjoy a good yarn, I have no desire return and relive them. It’s a bit like going back to an old haunt – It is never the same and rarely lives up to expectations. worth the journey. 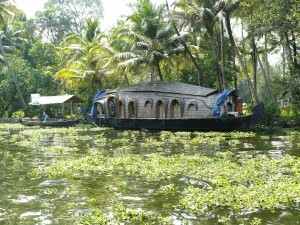 We also went on a “backwaters” excursion spending a night on a rice boat. I do not recommend this for reasons I will not dwell on at great length, but would mention that the air conditioning broke during the night and they had to start the engines, which were awfully loud and somewhat smelly, and being stuck under a mosquito net with no ventilation was not my idea of fun!! I would suggest that, unless you are with a party, it is not all it is cracked up to be. The best bet is to have a half day trip instead. This however was the only negative of the holiday. Another thing we found when Josephine mislaid her blood pressure pills is that if you know what you need then you can buy it, no questions asked. The pharmacies are amazing. They did not have the actual pill she takes but were able to give her two that produced the same effect. They sell all medication as individual pills or in bulk – seven day supply 60p. Prescription, what prescription!. May brought Josephine’s sixty-fifth birthday. 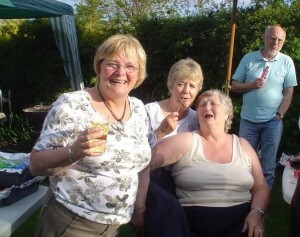 I had organised a surprise B-B-Q at the house for around 70 family and friends on the May bank holiday Sunday. She knew there was to be a family party but had no idea of the scale up to the time they started arriving. It was a nerve wracking experience as it poured with rain all morning and, although I had a marquee, trying to run a barbie in the wet is no fun. I shouldn’t have worried: at one thirty the sun came out and remained for the rest of the day. Of course the party ran on late into the evening. When we finally awoke the next morning (just about) we found that her brothers had cleared everything up and taken down the tent. The relief cannot be imagined! We went to a production of A Mid Summer Nights Dream, staged in a tent, as part of the Belfast Festival (something akin to the Edinburgh Fringe). It was performed by Footsbarn, a travelling group of international players now based in France though originally from Cornwall. We have seen many productions of Dream and I would rate this as the best ever. Only minuses were benches without backs and no interval. If they ever end up playing in your area they are well worth a visit. November took us back to Lanzarote for a week to recover from the cold and lack of sun. Stayed at the same apartments as last year and I was pleased to find that it was still up to the same standard. Had a great time and ate and drank too much. We walked for miles to work off the excesses. I also got a chance to practice my German, as about 70% of the clientele were from there. Managed to hammer a contingent at Boules – a particular Canaries version of the well know French sport. Luckily the French never go to the Canaries. We arrived back just in time to celebrate a good friends 80th birthday. He was complaining that he got a shot back this year. He now plays about three times a week off 13. His wife is 78 belongs to a different club and plays the same amount, A really amazing couple. If we are anywhere near as capable when we get to that age I will count us extremely lucky. It has been another year of voices from the past. Not only from the Int. Corps (Jim Malone and Tom Curry from ’69). Two of my intake at the REME Junior Leaders Unit at Arborfield, where it all started in September ’60, got in touch as well. Now have a photo of the athletics team from ’61. I was definitely better looking then. From a work point of view we are lucky that about 80% of our business is with government or government related concerns. They already have their budgets allocated so hopefully we will at least maintain our market share which should see us through. Another point is that Northern Ireland is always in recession, it really is a matter of whether it’s a bad depression or a good one. One can only be positive about it and hope for the best. I haven’t noticed the senior partner putting his yacht up for sale anyway. I think everybody will probably know someone who has suffered as a result. My golfing partner who was a senior manager in a Construction supply company was “offered” early retirement last week and my granddaughter was laid off as well. Luckily Peter works for me – nothing like a spot of nepotism. As we head into December it is the usual round parties and socialising and planning for next year. We are off to Vietnam in February, god willing. 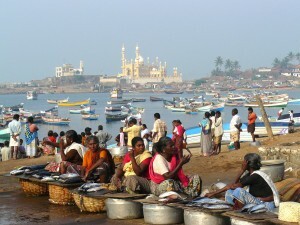 It was planned as a change from India and with the current situation there I reckon it was a touch of priescence. Mind you we are supposed to be staging through Bangkok! Probably it will be sorted out by then or, if not, the airlines will change to Kuala Lumpur or Singapore. I always was the eternal optimist. I have just got home after having hit a patch of black ice and sliding gracefully into a wall at the bottom of our street. It made quite a mess of my wing, front spoiler and headlight! My worry now is that, after being hit from behind two weeks ago, what will be the third mishap. Not that I’m superstitious!! Well, I will end by wishing you all the very best for Christmas and as prosperous New Year as you could wish for. Health and happiness make up for everything so they tell me so I wish you and yours a plethora of these as well.